Sugar is finally getting some media attention as the ultimate diet demon. Dieticians now agree that refined sugar has no nutritional benefits. Everyone would be better off cutting it out completely. Low-carb dieters knew about this for a long time. White sugar is pure carb. There is no place for it whatsoever on a low-carb diet. So does this mean you will never eat anything sweet again? Of course not! Sugar substitutes and sweeteners are now widely available, both online and in the High Street supermarkets, shops and cafes. With dozens of different products out there, I often get asked which ones are the best options for a low-carb diet. Below is a quick overview of popular products, as well as my personal choices, based on nine years of experience as a low-carb dieter and baker. These are artificially synthesised compounds, usually much sweeter than sugar. Carb counts are typically zero or close to zero, when taken in pure form. Because of their intense sweet taste, artificial sweeteners are often “bulked” with fillers, to make them more like sugar in texture and taste. Some fillers are high in carbohydrates in their own right (for example, maltodextrin in Splenda). Some artificial sweeteners – especially aspartame – have a bad reputation for adverse health effects. The best option in this group is sucralose. It doesn’t have harmful side effects, unlike some other substances in this group. It has a long track record of safe human consumption, and was recommended by Dr Atkins as the preferred sugar substitute on Atkins Diet. Sugar alcohols come from natural substances, but are usually processed heavily. Their molecular structure is somewhere in between sugar and alcohol. Our bodies cannot process polyols fully. So although their overall carb count can be high, most of the carbs don’t get absorbed or metabolised in the body. So the net carbs count is much lower than that of sugar. The exact amount of net carbs varies from product to product. Sugar alcohols can often cause digestive upset and act as laxatives. For more information about sugar alcohols, including nutritional information and net carb counts, have a look at this overview of sugar substitutes at KetoDietApp blog. Out of all sugar alcohols, erythritol has the lowest net carbs content and fewer digestive side effects, so I would recommend it as the best choice in this group. 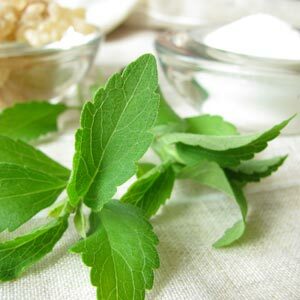 Stevia is by far the most popular and widely available plant-based sweetener. 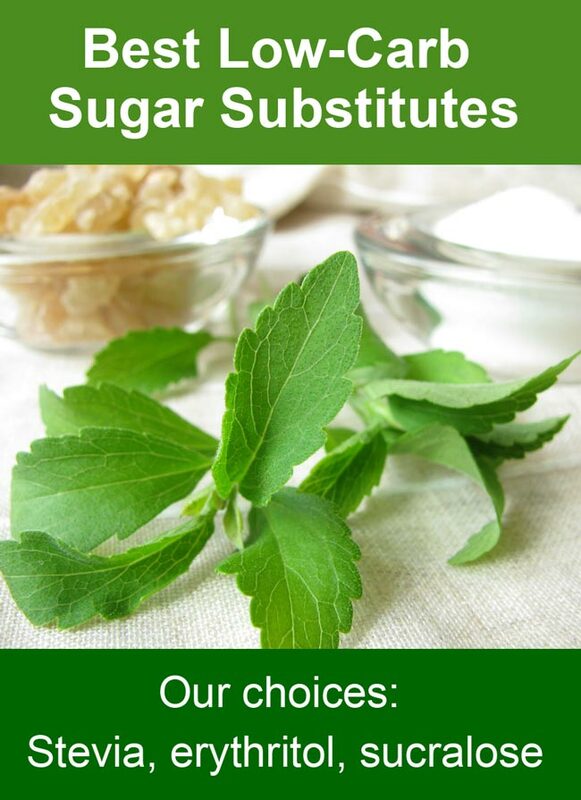 The leaves of Stevia plant are naturally sweet but contain no carbs. Dried powdered leaves can be used on their own. This would probably be the best one, being both low-carb and unprocessed, but it tends to be quite expensive in this form. Processed Stevia products are available, usually in form of drops, or mixed with a bulking agent (such as erythritol) to create the more familiar granulated product. Read more about the origins and production methods for Stevia in this in-depth NY Times article. Luo Han (monk fruit) is also a natural plant-based sweetener, but is less common than Stevia, and typically difficult to buy offline. As is the case with Stevia, extracts and mixes are more common than its pure powdered form. Watch out for misleading information on labels – manufacturers often try to disguise sugar content by using synonymous words to describe it. Some products labelled as “healthy” or “low-carb” turn out to be not quite so on closer inspection. Be vigilant when trying new brands! High Fructose Corn Syrup (HFCS), demerrara, turbinado, brown rice syrup and dextrin are all sugars – just with a slightly different name. Some natural sweet foods and plant syrups are used by the Paleo crowd instead of sugar. Some commercial sweeteners are bulked with other substances in order to make the texture and sweetness similar to sugar. Some of these are high in carbs in their own right. The two common ones to watch out for and avoid are maltodextrin and dextrose. A better bulking option would be a sugar alcohol. For example, erythritol is used in Truvia and Sukrin brands, and is very low in carbs (0-5g net carbs per 100g). If I had to pick just one product for all my requirements, I would go for Sukrin, sucralose drops and Stevia drops are usually bulked up with just water and a small amount of alcohol. They are a good choice to use when texture and bulk are not an issue, for example, for sweetening beverages or making desserts that don’t require baking. Thanks for the info! I was wondering why you don’t mention Lakanto? I have recently been diagnosed with GD and was told this was a great substitute that wouldn’t affect blood sugar or insulin levels. Hi Stella, Lakanto is a brand name for monk fruit mixed with erythritol. I mentioned monk fruit in the article, but I didn’t know about this particular product. Thanks for pointing it out, I will add a link to it. Best of luck with your diet! Hi, thanks for your post. The nutriction facts for Truvia show 3g of Total Carbs (Erythritol), which is not what I read in your post. Does it still better than Splenda? Thanks for your help!! Truvia is a bit tricky because they have different products sold under the same brand name. Truvia Zero Calorie Sweetener has 0 carbs and 0 calories. But they also produce Truvia Baking Blend and Truvia Brown Sugar Blend, both of which are quite high in carbs. It gets even more confusing because different countries have different food labelling regulations on how to show calories and carbohydrates on the packaging. Overall, I think the safest thing is to look at the calories information. If the label shows zero calories, this means none of the carbs in the product is digestible. But if the label shows some calories, they can only come from digestible carbs. Each gram of carb has 4 calories, so you can estimate the number of digestible carbs based on that. Great! Thanks. I have been on a low carb diet since june with excelent results! Glad I found your website. Thank you Rodrigo 🙂 Best of luck with your diet! So that’s good or bad? I would say bad(no digestible); however, it then says, ‘if it has calories’ it’s bad. Which one is better? Thx.!! Hi, apologies if this wasn’t clear. If you are on a low-carb diet – or just simply trying to cut calories – then non-digestible sweeteners are a good thing. You can enjoy the sweet taste without consuming extra calories or carbs. Although they can upset your digestive system if you eat too much. What about the liquid Splenda brand? I have some but am scared to use it as I have no clue as to its calorie/carbohydrate amount.. I’d assume zero as there are no bulking agents I noticed but on their website they say 10 cals and .2 grams of carbs per SQUEEZE. Which is 1/16 of a teaspoon! 10 cals per squeeze seems very scary indeed! Could you please send me the link to the page you are referring to, where it says 10 cals per squeeze? Looking at some low carb recipes, why do they have erythritol and stevia in them? Umm, not sure what you mean? Erythritol/Stevia mix is my preferred sweetener (as explained in this post), so I use it instead of sugar in all my recipes. Hi as someone just starting a LCHF diet I found your article very useful. It’s summer time, read ice cream time. For homemade low carb ice cream would the liquid sweetener be best? I have tried several sugar alternatives (Splenda, Stevia, Monk fruit, and Xylitol) and they all give me migraines. Can you recommend anything else for my low-carb lifestyle? The only other options I can think of are sucralose and erythritol. Sucralose is an artificial sweetener, ideally go for the liquid form to avoid fillers. EZ-Sweetz is a good brand. Erythritol is often mixed with Stevia, so you would need to avoid those. Sukrin do a sweetener product that’s pure erythritol. Best of luck – hope one of these works for you!